Good morning fans from the Australia! I am through to the final of the semi’s! It is a wonderful times and I really just can believe it. It’s been a wonderful journey. I had to make the disclosures in the interview about how scared the little guys are of my playing arm. When I toss the ball in the air they need to make the calculations; left, right, net, long, shankings? So many choices and by the time they have decided I am already sitting down. I don’t need the ball servants to hold the umbrella as I usually play the night matches. I don’t know why this is but I make the nod and the winkings with both eyes. Also revealed by my good friends at The Tennis Space when they interviewed My best friend, Pistol Peter, is that we hang out sometimes using telephone technology. We catch up, talk about movies and whether we have met the actors and actresses (lady actors). Sometimes we also play the game, “I’m the GOAT”. This is when we repeat the phrase to each other, ‘I’m the Goat’, and then Peter says, ‘No, I’m the GOAT’. We take turns and I usually choose to win. I told James Courier that I love tennis and watch all the night matches! This is true I can make the confirmations. Though I’m usually in the night matches so really it’s Me, watching Myself, whilst playing! It’s a bit like Kojak watching his own top show! Who loves Me baby. Talking of which, I’d like to thank the Australian Open for rolling out the Fed carpet in the way I have been treated. And now for the final of the semis against Andrew of the Murrays. I’m trying not to think about it too much and focusing My attention on My shoe laces. If the match turns into the shape of a pear I have a secret tactic! I will do what we now call, “An Azerenka”. This means that I will go off court, have a nice meal, take a hot relaxing bath and maybe take in a movie before returning. I will decide later if I choose to win this match, as always you’ll be the first to know. Dear Maestro. I love you. With all my heart and soul and my little possesions. God Bless You always. From Mexico, with love, Lucía. 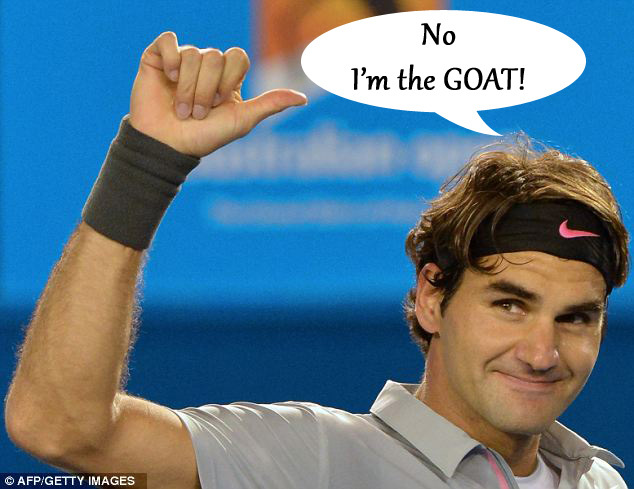 Roger, you really are the god of tennis! Now this is what I call amazing piece of blogging. Hello Super Grandmother. Nice to see Me as usual. Good luck (not that You should need it) to #GOAT vs. the Scottish one. Am hoping you will choose to win today. Had a small wager on 4 or 5 sets. Looking forward to courtside tweetings. Can you explain why did you choose to lose today? When PF is lying in His bed many years from now, would He be doing the willings to trade all the days from today to that for one chance, just one chance to come back to Melbourne Park as a mature player, wearing a vest under his lilac over-shirt and pink shoelaces in his trainies, and tell Andrew of the Murrays that He may have chosen to lose the match, but he will never, ever, evah TAKE HIS #GOATdom !!! At least Your shorts were perfectly pressed. Always the gentleman. That is another reason why Andrew of the Murrays will never be a goat of any sort, even if he comes from the country that prides itself on inventing the word “gentleman”. And even if he “mekkers” al lot (mekkeren being the Dutch word for the sound a goat makes, but also meaning nagging). That and his bad hair of course.